11.2oz bottle served in a tulip glass. Date stamp of L17 19 on the back of the bottle. "Brewed with Eucalyptus leaves" - this ought to be interesting. Appearance: Translucent golden-amber - like the color of orange blossom honey. Initial large white head died back to a thin skin of foam and ring at the edge. I poured slow to leave the sediment behind. Very little lacing. Smell: Strong eucalyptus aroma, along with some underlying honey, floral, and yeasty notes. Taste: The eucalyptus is front and center - definitely a bit of a coughdrop flavor at first, but then there is some underlying herbal leafy taste, fruity esters, and a mild honey sweetness. The finish is medicinal - eucalyptus again. Mouthfeel: Highly carbonated, but not fizzy. Scrubs the palate clean. Dry finish. Overall / Drinkability: Definitely one of the more interesting tripels I've had. I can't say I'd want another one of these in one evening, or if I would be willing to buy it again, but the eucalyptus is an interesting take on bringing more herbal flavors to a tripel. In a way, it's a medicinal beer. I suppose if I was a monk and I wanted my beer to have some additional healing powers that help the throat and clear the sinuses, this would be the beer to brew. Bottle. Hazy orange copper with lasting head and lace. Spicy yeasty aroma with only a hint of eucalyptus thank god. Sweet candi sugar vanilla peach with herbal and eucalyptus finish. Medium body soft a reserved carb. They didn't ruin it with eucalyptus. I can't believe it. From a twelve ounce bottle, this brew is a golden, very effervescent, clear liquid. The head is intense, white, and firm. Wonderful Belgian aroma...spice, flowers, and fruit. I haven't had a Trappist beer is a while. Malt, yeast, intensity, high alcohol. Smoothness. This was an excellent beer. From the 330 ml. bottle with 1720 stamped on the back label. Sampled on March 9, 2019. It is a nice looking beer I will give it that with its copper-caramel-amber pour and lingering tan head. Gentle upward bound carbonation bubbles. The aroma is quite a surprise but it should not be since they clearly say it is brewed with Eucalyptus. That takes over everything including the buried caramel malts and banana characters. No booze for 8.5%. The body is in the medium or better than medium range and smooth. As it warms I will say that the flavors merge together well but I think the Eucalyptus is just a bit overdone. Otherwise sweet and mild to moderate bitter end. Not something I will return to. Pours hazy, gold in color with 1/3 head. Taste is mineral, sandalwood, ginger, and hay, honeycrisp apples come in at the end. Medium-heavy bodied, sweetish, with high carbonation. Different tasting than other tripels I have had. Really enjoying this one. Nice combination of flavors and lacking some of the overbearing sweetness in some examples of the style. T - Nice ginger notes up front with some sherbet citrus there is a long sticky lingering finish. I've enjoyed many Trappist beers, including all of them from Belgium and at least one here in the US. Add this Christmas gift to the list, though I must say I was skeptical considering its origin... Italy. Having just returned from a trip there, I can attest that their wine is great, their people are great, their country is great and their food is great. Their beer, not so much. 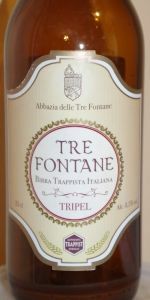 But this one has earned my respect, probably because it hails from a Trappist brewery--Abbazia delle Tre Fontane--where monks who are preoccupied with work and prayer and unconcerned with the outside world make some exceptional beer. Like the Abbott at the legendary Trappist brewery of Westvleteren said, ""We are not brewers. We are monks. We brew beer to be able to afford to be monks." This Tripel poured a dark copper with an evanescent cream colored head that dissipated rather quickly. First olfactory impression was that it was going to be cloyingly sweet--maybe due to candi sugar--and it had earthy floral and herbal notes. The eucalyptus was faint in the nose but more evident on the palate. I got raisins, plums and other stone fruits as well, by using the retro-olfaction technique. A nice, bitter, peppery kick on the back end made for a pleasant drinking experience. When I get a tripel, I sip and savor; and this 8.5% tripel was most satisfying. In the future,when I am asked about Italian beer, I can discard my previous experiences and say, "Well, there's this ONE you really should try...."
A: Dark coppery pour produces a monstrous 3+ finger foam capping, light beige in color with spongy texture and large cavernous craters. Lots of carbonation in this one, rushing up the side walls of the chalice with a feverish pitch. An everlasting head retention gives patience before the first sip. Large sloppy deposits of foam dabs line the vessel walls. Coloring was bit dark per style, but no worries. S: Some lightly dry banana chips along with fresh oatmeal and lemon meringue pie. Fresh banana breadiness moves in after it settles a bit, along with some lemon cookies, all of good strength. Spicy warmth of cinnamon, allspice and alcohol. T: Banana bread makes up the body and substance, spicy dark crystal malts adds the flair, with some raisiny grain additions. Warmth of alcohol soaked bread, toasted honey and sugar cookies round things out. M; Very spicy mouthful, bubbly and very crisp to style. Toasty maltiness adds warmth. O: A very refined malting and taste of alcohol done in a precise fashion that only comes from trappist quality. Spicy toasted banana bread, with a great drinkability and enjoy ability factor at 8.5% that is seemingly perfect. Very cleanly brewed, crisp, flavorful, but then again what would you expect from a Trappist quality label. $10 bottle but well worth the experience. Refined and eloquent drink with outstanding qualities. Highly enjoyable with an ensuring aftertaste that is sure to please and want more. 12/18 date, I assume best by? I bought this earlier this year. A: Pours a nearly-clear gold with an enormous frothy tan head. Head is very light and fluffy and fizzes out quickly at first, slowing and finally with the remnants sticking around forever. Head looks like soap bubbles, almost uncanny - in fact I expected it to smell like soap when I first sniffed it. Very little lacing, it's like it just doesn't want to stick. S: Very strong aroma, I assume due to the higher carbonation. Smells quite sweet, like poundcake maybe? Some light fruits in there, hints of citrus I'd say. Some white pepper too. Very sugary in general. T: I was expecting it to taste very sweet due to the aroma, but it really isn't. Doughy with plenty of citrus. White pepper and earthy spices. Light bitterness, I assume some herbal hops? There's some oily, minty flavor in there too, is that the eucalyptus maybe? Mainly get it in the finish/aftertaste. M: Medium bodied, a bit oily. O: Interesting and unique tripel. It's a bit odd honestly, not sure I'm a fan. A: The beer is clear light amber in color and has a column of bubbles rising from the center of the glass. It poured with a short bright white head that quickly died down, leaving a large patch of bubbles on the surface and a narrow collar around the edge of the glass. S: Moderate aromas of candi sugars are present in the nose along with hints of yeast and associated spices. T: Following the smell, the taste is dominated by flavors of candi sugars but nearly all of the associated sweetness is balanced off by underlying notes of spices. M: It feels nearly medium-bodied on the palate with a moderate amount of carbonation. O: You can definitely get the sense that this is a strong beer given the presence of candi sugars but it manages to do a good job at hiding the alcohol. Pours a cloudy amber color. One inch head of an off-white color. Good retention and slight lacing. Smells of a hint of wood, hint of sage, slight citrus hops, sweet malt, slight alcohol, yeast, esters, dough, and a hint of cinnamon. Fits the style of a Belgian Tripel. Mouth feel is sharp and clean, with an average carbonation level. Tastes of slight citrus hops, sweet malt, alcohol, yeast, esters, dough, and a hint of cinnamon. Overall, great aroma, great complexity, good blend and body. The cinnamon/sage combination might be eucalyptus, but I have no reference. The eucalyptus gives it an herbal, somewhat menthol-y finish that lingers quite a while. It serves its purpose to cut the sweetness of the style but distracts from what is otherwise a nice tripel. The last of the trappists to try, at last! Some distinct impressions: herbal and earthy tones, especially at end are interesting at best, and kind of vegetable weird at worst. Leave it to the Italians to make a beer that leans toward the wine world in body, light, dry like a white wine, and carbonated. The cook spices, the subtle fruits and candi sugar all comes together as an ok whole, but are more enjoyed separated in each sip around the palate. It doesn't get too sweet on bitter, rather bounces around in between. The lightly hazed dark yellow, almost orange, colored beer pours out into a Duvel glass with a full 2” off-white head even with a slow gentle pour. The foamy head slowly recedes leaving a complex pattern of rings and a web of lacing with lots of patches and slender legs of lacing that persists for most of the beer. Sipping creates two sheets of foam that become large patches and legs of lacing. The aromas are mostly about the almost minty eucalyptus up front along some green orchard fruits and a slightly herbal character all backed up with a bit of wheat and bready malt. There’s also a touch of clove and some light spiciness. The flavors are somewhat as expected from the nose with the almost minty eucalyptus up front and supported by some green orchard fruits. There’s also a bit of herbal character and some bready malt and wheat. The Belgian candi sugar sweetness blends nicely with a bit of clove and some other spiciness that includes some white pepper. There’s also some herbal bitterness that goes nicely with the mint like eucalyptus. The mouthfeel is on the light side of medium bodied and lightly prickly with some persistent finely bubbled carbonation. The finish begins as the sweetness, breadiness and fruitiness recede to leave behind a slightly bitter herbal, spicy, minty and semi-dry ending. A solid, interesting interpretation of a Belgian-style Tripel with the almost minty eucalyptus character backed up by some green orchard fruits some candi sweetness and some light spiciness and herbal bitterness. While this is enjoyable and drinkable beer, this is both a one a night beer and a beer to be enjoyed and savoured slowly. I definitely expect to be looking to have it again but it will be an occasional thing rather than a regular. For that there is the Westmalle Tripel.